Flatbed uv digital printers use uv inks made of acrylic monomers that are then exposed to strong UV-light to cure, or polymerize them. This process allows for printing on a wide variety of surfaces such as wood or metal, carpet, tile, and even glass. The adjustable printer bed makes it possible to print on surfaces ranging in thickness from a sheet of paper often up to as much as several inches. The working platform of the A3 Small Format UV LED Desktop Printer employs dual gantry beam motion control system, ensuring accurate positioning of both rigid and flexible media. The repeated positioning accuracy of the flatbed printing machine reaches up to 0.02mm×0.05mm. Maintenance friendly, this high resolution printer is adaptive to continuous production and batch production. The reasonable size of the working platform helps realize one-man operation. Our A3 Small Format UV LED Desktop Printer is suitable for printing individualized products, like advertisement, picture, gift, toy, and some others. UV white ink and UV transparent gloss ink are optional for multiple functions. a)	2-4 Ricoh GEN5 grayscale piezoelectric print head for printing with ink droplet ranging from 7pl to 21pl. High-definition printing in 2pt font is available. 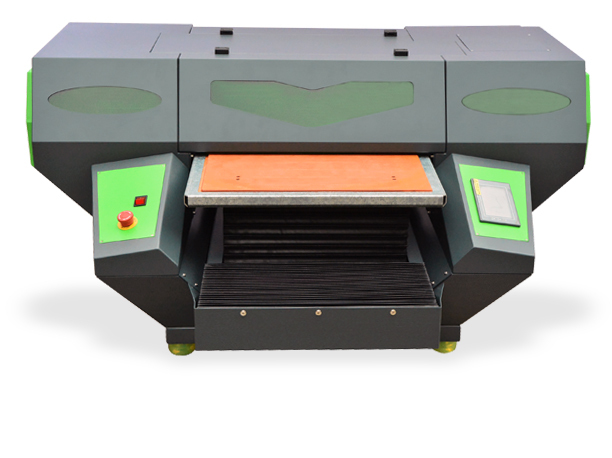 d)	Fixed linear raster is adopted for the positioning of the print head carriage, ensuing high-precision positioning and printing. e)	Unique medium stop lever makes for convenient media loading, precise positioning, and deviation-free repeat print. 3)	Various suitable media: Glass, acrylic board, wood board, ceramic tile, metal plate, PVC board, corrugated board, plastic, and so on. 5)	The small format UV flatbed printer has 16 white ink printing modes, such as white ink over and under printing, white substrate printing and pantone printing. 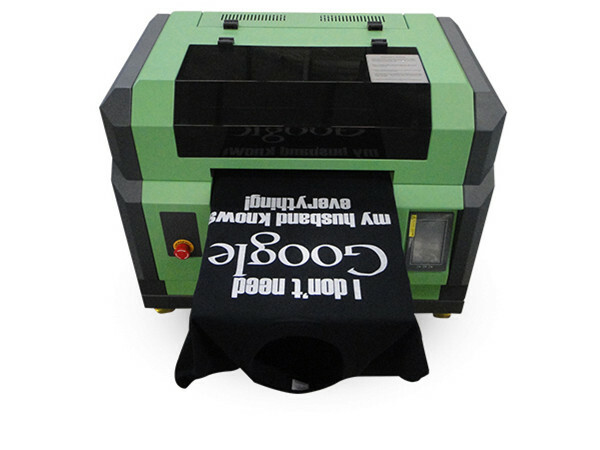 Apart from that, printing with 3 types of special gloss ink is also available. 7)	The ultra powerful vacuum absorption mechanism can make media firmly absorbed on the printing platform; and the media susceptible to thermal deformation are particularly applicable. c)	The irradiation power of the two UV/LED lamps can be set to rotate by turns according to the back and forth direction when bidirectional printing, which can effectively reduce the depth of the pass banding. d)	The powerful nozzle compensation function allows functioning nozzle to replace the failed nozzle to continue the ink-jet printing, ensuring that the printed picture does not have banding or the pass banding. 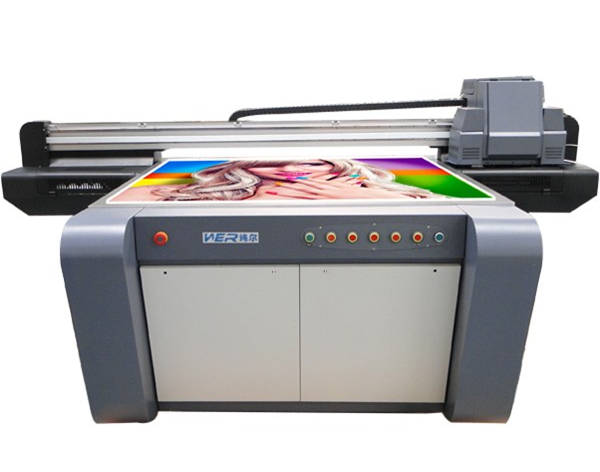 e)	Our UV printers is equipped with powerfully functional, intelligent and user-friendly RIP software, such as SEEGET, CALDERA and ONYX, which can enable the overlapped different pictures to successfully output, greatly facilitating the daily work of color proofing and substantially improving the output efficiency of pictures. f)	The mechanical pin registration system facilitates the loading and unloading. g)	The carriage’s anti-collision system can automatically stop when come into contact with the medium, which can protect the trolley and print heads. i)	The optional print modes for production line make this product suitable for industrialized online production. a. 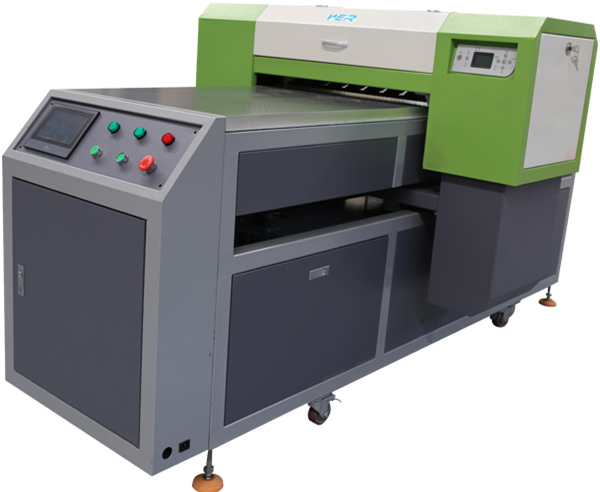 Our whole series of digital printing equipment is designed in accordance with the production mode of 24×7; we have adopted a variety of durable components in line with the requirements of industrial production, especially the industrial Ricoh GEN5 grayscale piezoelectric print heads, which can be used for 3-5 years if carefully maintained. b. The control panel is installed with high-speed and stable Lenovo workstation; the system platform is installed with the WINDOWS system featuring smooth running and low maintenance. c.	Our UV printer has stable and reliable overall steel frame structure and dual gantry beam structured steel beam, which can effectively guarantee quick, smooth and steady printing process. d.	There are IGUS towline, AB servo motor and MEGADYNE step belt, which all ensure that the system is in stable and reliable long-term operation. e.	Our hybrid printers is equipped with emergency stop that to guarantee the safety of both operator and equipment. f.	With emergency backup power, our UV printing machine can still maintain the negative pressure system and its proper functioning when the main engine has suddenly loses power; correspondingly, our printer will quickly restore the working state when there is electricity. 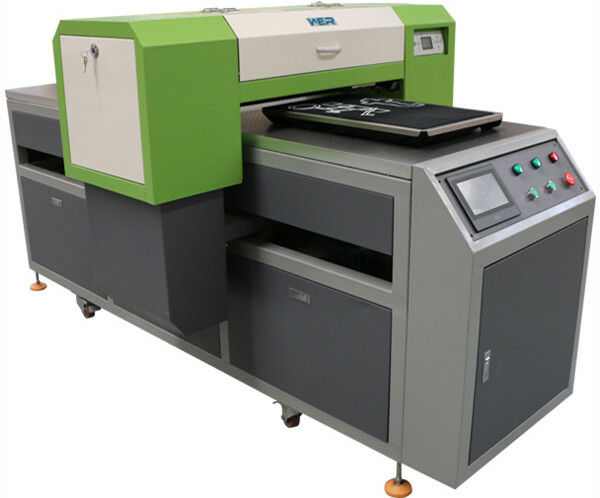 Our hybrid printer has Ricoh grayscale piezoelectric print head which can realize variable ink droplet printing. Its 4-color printing can reach the same effect with that of 6-color printer without grayscale print head whose ink droplet is in the same size no matter the image is in light or dark color. Therefore, when the image color is relatively light, it is only because the light color ink (Lc, Lm) is output relatively less. However, for the grayscale piezoelectric print head, the ink droplet can be output in different sizes in accordance with different colors. It will output 21pl to print the dark-colored part of image, 14pl for light-colored part, and 7pl for very light-colored part. It means that the dark-colored ink can be output relatively less to achieve optimal printing effect. Our hybrid UV printer makes full use of the environment-friendly UV curable ink free from VOC (Volatile Organic Compound) - the new trend in the future! Since UV-curable ink supports direct printing on various media, this product can be used in place of traditional silk-screening printer, sometimes. 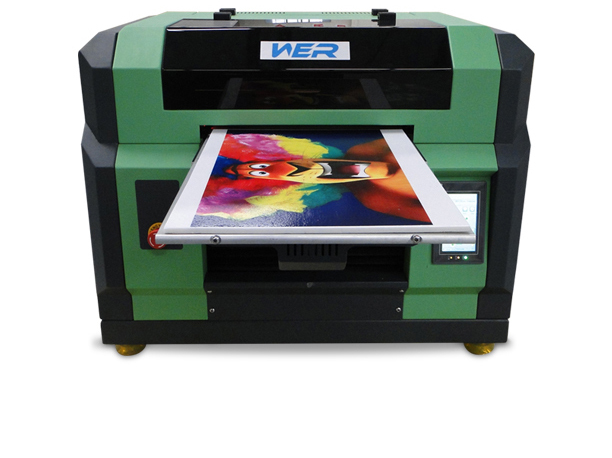 Breaking through traditional technology, our small format UV flatbed printer offers richer color combination and higher working efficiency. The rapid development in individualized product processing industry makes our product suitable for printing on home appliance faceplate, furniture panel, suspended ceiling, wood floor ceramic, etc. 1. When the equipment sent to the customers and ready to all install, the first thing is to prepare a voltage regulator, while civil voltage is stable now, but still there will be some floating up and down. Because of the voltage instability, which will have some difficulty in installation. The problem we met mostly may be the connection to computer, or after the online software can't normally opened, also is the computer power cord unexplained fever, which may affect the equipment! At this time we are going to use multimeter to measure the voltage to solve this matter! 2. When we switch on, machine reset successfully, then we open software. Since the connection when the machine is reset software absorbing ink pad will be a process of down and up, the device is reset, so as to lead to errors instructions, machine reset failed! 3. When using the equipment, printing products if happens to catch up with something not in, so it is better to turn off the software. Because the device under the connection state of software will continue to control flash spray nozzle, after a long time will lead to absorb ink pad ink spill over into the ink pad on the lines below, after a long time will affect the equipment! 6. Before printing works, you should make sure printheads don't hit print media, adjusting the nozzle height then send the print task. There are some more similar designs related to this article, please have a look at the related products, or you can contact us for your requirement with details. We would be delighted to offer you more information.